In Kansas, the rule of thumb is to plant potatoes on or near St. Patrick’s Day. We had bought our seed potatoes at the garden show this past year. The girls were digging through the different boxes of seed potatoes and spotted the purple potatoes at the exhibitor’s booth. I think it is fun planting unique and different veggies. It makes it more interesting and gives the girls something to tell their friends. It was only about 95 degrees when we began harvesting potatoes, and the girls were sporting their swimsuits, of course. Scary thought, if we all garden in swimsuits. First the red potatoes; I was happy to see that they yielded better than last year. We dug up the purple potatoes second. They were harder to see since the outside skin of a purple potato is dark and somewhat camouflaged in the soil. Our yields were lower, but I expect that with a novelty crop. When you cut them in half, they look tie dyed. We boiled them and mashed them up for supper! 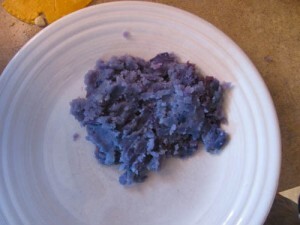 Eating purple potatoes was like eating food from a fairy tale. They were such a unique color on the dinner plate. The girls gobbled them up and asked for seconds. It is so rewarding feeding my family from the garden. I am not an organic gardener but I am cautious as to what I add to our garden. I am very confident that the food from our garden is safe and nutritious for our consumption. How does your garden grow? What is the most interesting thing you have planted?